Genesis Iron Man in 06:33.59 by Mothrayas. 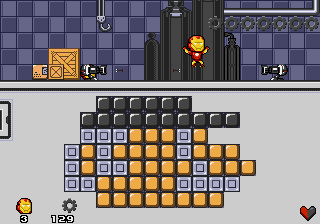 Iron Man is an unlicensed bootleg Genesis game, made by a Russian developer team (best known as the Unknown Russian Developers, said to be known as Kudos or Kudos-Game) and released circa 2014. The same developers have made many bootleg Genesis games based off various licenses, including Mario 3: Around the World, Mario 4: Space Odyssey, Ben 10, and many more. Mothrayas runs through the 120 screens of this game in record time.